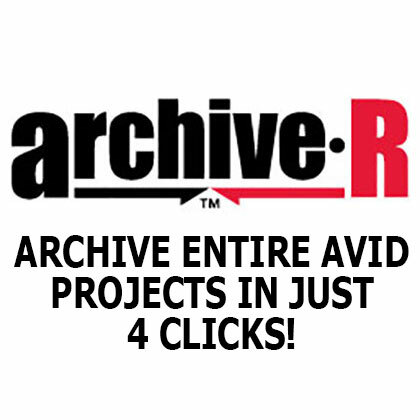 Archive Avid Projects and Media in Just 4 Clicks! archive-R™ is an easy-to-use standalone software application for archiving, moving, and restoring complete Avid Projects and all their associated files including: Bins, Sequences, Media, Attics, Settings, Everything. In one simple archive process, archive-R™ allows you to archive to a hard drive, burn to removable media, and remove the original files from your system. Include ANY Other Digital Media in the Archive! archive-R™ has a misc. files feature that allows you to drag- n-drop any digital media or folder into the archive. This allows you to back-up all your assets into one consolidated archive file. Notes, Photoshop files, everything. Scans for Avid projects and all associated Avid project files. Compatible with Avid OMF, MXF, and AMA media. Add non-Avid files to be included in the archive, i.e: graphics, projects, notes; anything. Archive to HDD, CD, DVD, DVD-DL, and Blu-ray, including disc spanning. Drive Mapping Restore Mode, allows you to restore the media files to the drive(s) of your choice. Restoring archive-R™ archived projects does not require an archive-R license. FREE TRIAL VERSION on download page. You are not required to purchase archive-R™ to restore an archive-R™ archived project. Simply download and install the archive-R™ FREE TRIAL version and you’re ready to restore using the ree archive-R™ restoration module with Drive Mapper. For more information about archive-R™, download the trial version and view the integrated product manual. Archive Avid Projects, Media and any other files in Just 4 Clicks! Download the latest version of archive-R™. Try Before You Buy: Until you purchase an archive-R™ license, you can run it in trial mode. Trial mode will allow you up to 3 Free trial archives. archive-R™ restores are free and unlimited.